The challenge for Day 63 was to go on a nature walk, pick up an item and draw it. It's still a quite cold around here and going on a nature walk in this temperature was not going to happen, specially living in the city. There's mostly snow and dirty trash. 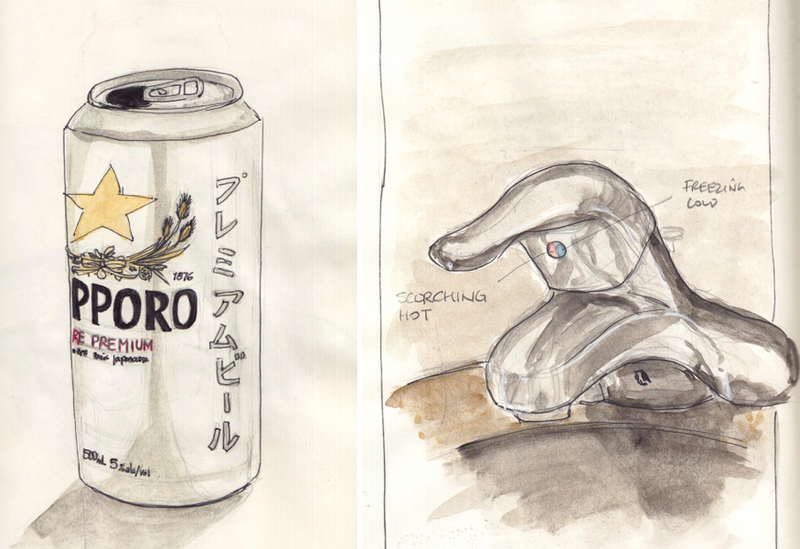 The alternative was to draw something that was picked up by my husband at the store that day : a pack of Sapporo, Japanese beer. They come in tall aluminum cans and have a neat design. It was a great opportunity to practice metallic material and reflection. For day 64 the challenge was to draw a sink. I drew the the bathroom sink, but concentrated on the faucet that I don't like. There's essentially four setting to this faucet : Scorching hot, uncomfortably hot, uncomfortably cold and freezing cold. They should seriously discontinue this model of faucet. But it was a great opportunity to practice a metallic surface again. I got to your daily paintings via your upload of Eric Thomas workbook, circuitious. I've just started indulging my latent creative side in sketching and a little poetry. Paints have always seemed too much faff for me to trouble myself with but confess to being inspired by your sketchy style water colours, what is the pack you use, brush etc - it strikes me as a good little kit to start with? Hi David. That's great! watercolour in my opinion is a great medium to start with. It's not too fussy and easy to clean and carry with you everywhere. For the brush I currently use a Sakura waterbrush. These are very convenient to quickly add colour to a sketch with little to no fuss because the water is in the brush, you can paint almost anywhere and don't need a lot of set up. For the colour I currently use watercolour travel boxes from Pebeo and Van Gogh. Typically these kits come in different sizes and some people even make their own mini travel watercolour kit that can fit in a pocket.